Week 36 - Lensless Camera Manufacturing Co. 4x5 Pinhole Camera, received at Christmas 2014 from my wife, Brenda. I have been weighing whether or not I wanted to delve into large format film photography for some time, I thought a 4x5 pinhole camera would be a good jumping off point. Some of the obstacles for me for large format film were the cost, reliable processing, and the ability to scan the negatives myself. I've pretty much been keeping to small and medium format cameras, because I could pick them up at flea markets, craigslist, and yard sales for a few dollars. I don't have a lot of extra money to spend on my hobby, and I really just enjoy the process of shooting photos and developing them myself. When I first started using the 4x5 pinhole camera, I found a technique referred to as the "taco method" using a Paterson two reel film tank for developing 4 sheets of film. I successfully used this method for over 70 photos but when I saw the kickstarter for Timothy Gilbert's SP-445 developing tank, I thought this would be a great option for processing my 4x5's. My tank arrived a few weeks ago and I was eager to give it go. On labor day, I loaded up 4 of my film holders with Arista EDU 100 and took a quick trip to downtown Hanover to shoot photos of St. Matthews Church on Chestnut Street and then to the square to shoot photos of the cannon display there. I have to confess, I'm a bit afraid of the dark and only use a changing bag to load my film in holders and developing tanks. I found that loading the SP-445 from the film holders in the changing bag was a bit cumbersome, but with more practice it will go more smoothly. I think that I might invest in a larger film changing tent, especially if I wind up shooting more 4x5 film. The tank only uses 16 oz of developer for 4 sheets of 4x5 film, which is awesome! I followed the tips from the kickstarter project videos for processing and the only issue, which is very minor, is that there was a small amount of leakage around the caps. It wasn't enough to be a problem, but perhaps the next time I use it, I will follow the tip of wetting the O-ring around the lid before closing it up. The negatives came out well, I used a 1+1 solution of Kodak D-76 for 9 minutes. I previously had scanned my 4x5's in two passes on my Epson V500 Photo, then stitched them together in Photoshop. About six months ago, I bought an old Epson Perfection 2450 Photo flatbed scanner and hooked it up to an old iMac, creating a dedicated 4x5 film scanning station. The scanner cost $12 plus shipping from ebay and I bought the dead iMac from Craigslist for $35. I was able to fix the iMac and load an old version of Photoshop on it to use the scanner. Week 24 Camera - Ondu MKII 6x6 PInhole Camera received as a reward for backing the Ondu MKII Pinhole Camera Kickstarter campaign. 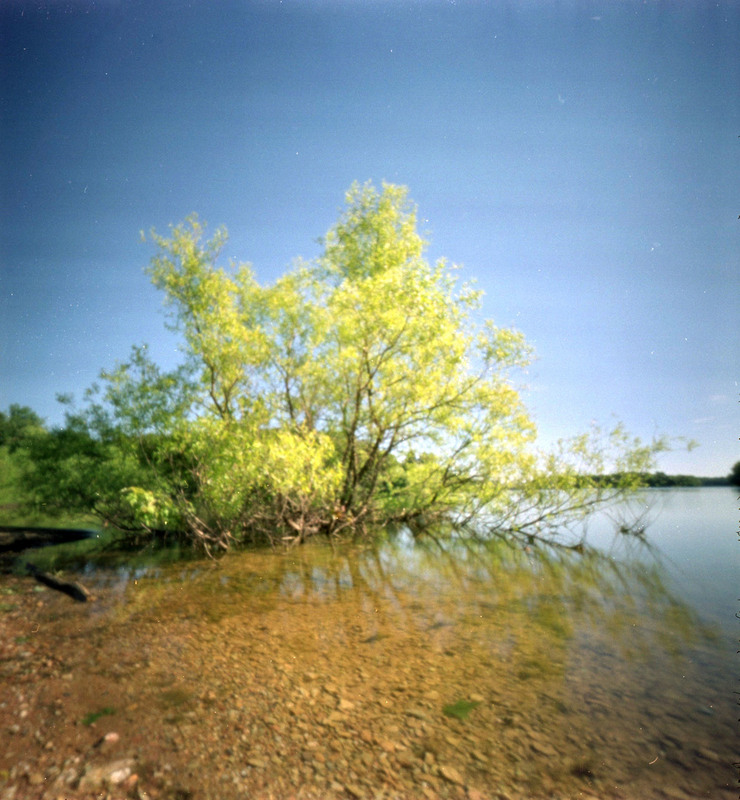 I love pinhole photography - the wide angles, the slightly distorted views, and the occasional sun flare. 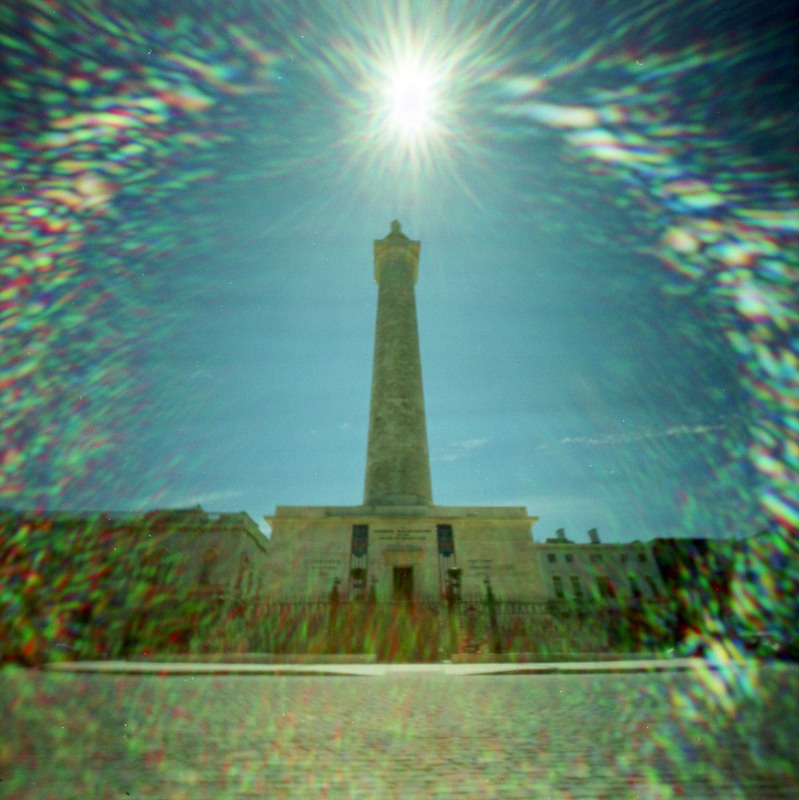 I truly admire the pinhole photographers that can achieve these otherworldly images. 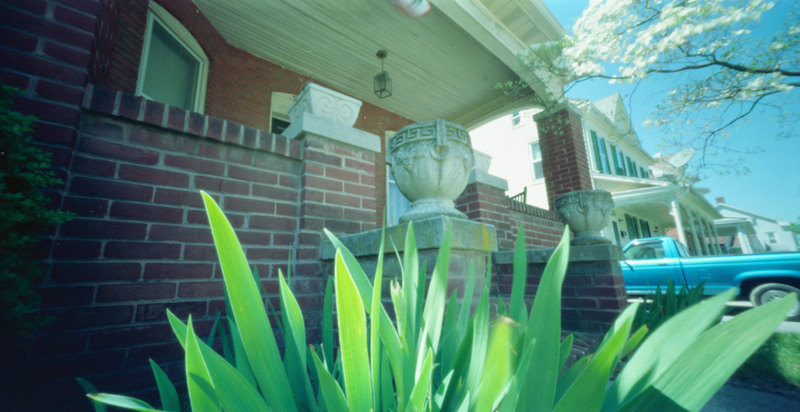 I can't decide if I like black and white pinhole photos with smooth tones or the sometimes wildly colorful sun aberrations achieved in color pinhole photos. The Ondu MKII 6x6 Pinhole is a beautifully made wooden camera with a new design where magnets hold the camera back in place as well as the film advance knobs and film spool holders. Their Kickstarter campaign had a few setbacks causing a delay in shipping the rewards, but I must say the camera was well worth the wait. Everything was light tight and the first roll of film through the camera worked great. I chose to load my Ondu MKII 6x6 with expired Kodak Portra 160NC and I went pinholing on my lunch break on a beautiful day last week. I walked to one of my usual places for lunch, the Mount Vernon area, with the Washington Monument and the Gothically styled architecture of Mount Vernon Place United Methodist Church. I prefer when the skies are partly sunny with puffy clouds, they look awesome in pinhole photos. It was very bright outside, without a cloud in the sky, but I did achieve aberrations in a couple of photos, not intentionally, but that was a bonus. I also shot a few photos in the backyard and of course, a front porch portrait of Brenda. The film roll was developed with the Unicolor C41 kit from Film Photography Project and scanned on Epson V500 Photo flatbed scanner. A bonus camera for my 52 Cameras project this week - with my birthday cash, I ordered a Holga WPC 120 Camera that I had been wanting to get for a couple of years. I thought I should get one soon as I wasn't sure how long they would still be available at a reasonable price. I bought one from Lomography's online store seeing they still had them in stock at a much lower price than other places where it was still available. I thought I would try another roll of the 2002 expired Kodak Portra 160NC in it and brought it along this past Sunday when we went to Codorus State Park and Glen Rock, PA. The camera is capable of shooting 6x9 or 6x12 photos with two interchangeable masks and has an f/135 pinhole, requiring the use of a tripod and a shutter release cable. I have been very impressed with the ultra wide photos that can be achieved with this camera, with some great examples being found on Flickr. After finally shooting with it myself, I can see that I need to try to come up with more interesting angles and subject matter and get in closer. Next time I will use my old standby, Shanghai GP3 100 Pan film developed in caffenol. 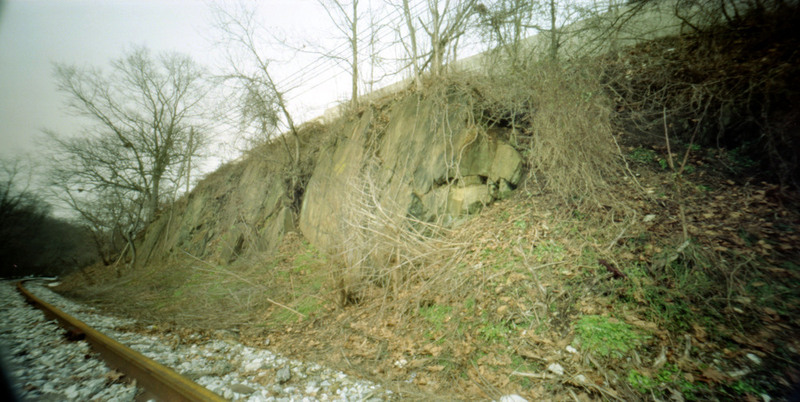 Film developed in Unicolor C-41 Kit purchased from Film Photography Project store and scanned with Epson V500 Photo.